United Healthcare is sponsoring a special "Walk Run Bike Play" initiative in Elizabeth Park. Beginning in 2017, United Healthcare decided to sponsor a series of “Walk Run Bike Play” programs in Elizabeth Park to promote the Park as a destination and place for healthy living—whether through exercise, meditation, or communing with nature. The Elizabeth Park Conservancy is very grateful for this sponsorship and has advertised with flags at the entrances to the Park and across from the Cottage. Parks play an important role for people to exercise. Through the efforts of the Elizabeth Park Conservancy, the Park is safe, clean, and welcoming. Elizabeth Park is your outdoor gym. Wallking is one of the best stress reducers and healthiest for your heart. Walking just requires a good pair of sneakers. 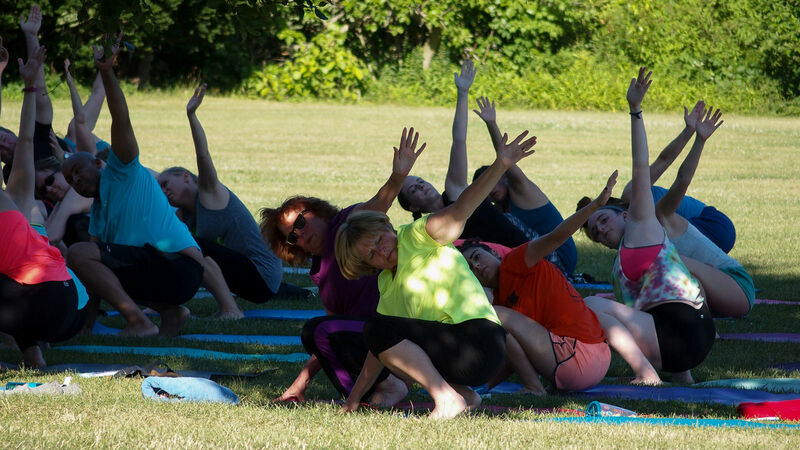 Yoga in the Park: Hartford-based studio Vasu Tribe Yoga hosts yoga classes every Tuesday and Thursday evenings at 5:30 p.m. from May 28th to October 3rd on the Rose Garden Lawn. No charge – just bring your own mat and water bottle. Contact information: 860-216-1476 or email info@vasutribe.com. Falun Dafa in the Park: Falun Dafa is held on Sundays from 9:00 a.m. to 11:00 a.m. on the Rose Garden Lawn. Falun Dafa exercises are a unique and enjoyable way to improve your health and well-being. No charge – just wear comfy clothes. Contact information: 860-221-8835 or email Falun.Dafa.CT@gmail.com. Tennis in the Park: Phil Gordon Tennis hosts tennis lessons and games from June 20th to September 3rd, Monday through Friday from 10:00 a.m. to 4:00 p.m. Meet at the tennis courts on the corner of Asylum and Prospect Avenues. For ages 6 to 17 years old. Lessons are free – wear sneakers. Contact information: 860-655-2122. Tell us your healthy Elizabeth Park story on our Facebook page.